← Will The Curse Strike Again? Hampton & Richmond Borough strengthen their squad with two new players as they look to win their fight against relegation. 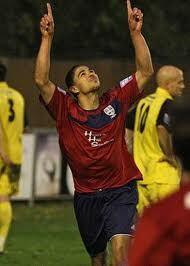 The club is delighted to confirm the arrival of Neil Jenkins and Joel Ledgister from Sutton Utd. Neil is an experienced left back who was unlucky with injuries earlier on in the year and had a successful loan spell at Kingstonians before re-establishing himself as the regular left back at Sutton. As the U’s are now looking for a more youthful squad to work with for going full time next year, Neil has been allowed to find himself another club. Neil began his career at Wimbledon before joining League 2 Southend Utd in 2002, collecting an England under-20 cap while at Roots Hall. Two seasons later he then joined Crawley Town, before hooking up with Eastbourne Borough, where he made over 170 appearances. He moved Sutton Utd during the summer. The club is also delighted to confirm that striker Joel Ledgister has rejoined the Beavers, this time on a permanent deal. As Sutton have just signed a new forward, Joel was surplus to requirements. Joel has the unusual record of scoring both for and against the Beavers this season. In further news, young striker Tobi Alabi’s loan from Millwall to the Beavers has been extended for a further 28 days. Tobi has impressed while at the Beveree, and a further month for him with the club is good news for all parties. We are delighted to publish this article, which has been kindly passed onto us by Rob Overfield, the Press Officer at The Beveree Stadium. The article was originally published on the club’s official site. The club can be followed on twitter here, and Rob’s own twitter feed can be found through this link. Posted on February 22, 2012, in UTL Archive and tagged Hampton & Richmond Borough, Joel Ledgister, Mark Harper, Vanarama NL South. Bookmark the permalink. 1 Comment.